Where is your hope? What are you trusting in to carry you through life? Journey with us in discovering six unshakable anchors of hope. About 10 and a half years ago, my mom lost her battle with cancer at the young age of 55. She was very dear to me; my confidant, my prayer warrior, and a strong woman of faith. When she passed, I was emotionally and spiritually devastated. I have been a Christian my whole life, and at the time, I had been pastoring for over 10 years. I had preached on faith and healing and saw many people miraculously healed, several from cancer. We all fully expected healing for my mom, and when it didn’t happen, I became deeply upset and angry with God. Why did He let me down? Why did He not come through when I needed the most? At this point, I contemplated quitting the ministry. I couldn’t bring myself to preach a gospel that didn’t work for me when I needed it to the most. How could I preach with confidence something I wasn’t even sure I believed anymore? Mark 11:22 says “Have faith in God.” Period. This was the verse my wife brought to my attention that snapped me out of my downward spiral. I quickly realized the meaning of this verse; to trust God regardless of the outcome, that His ways are higher than my ways, His thoughts higher than my thoughts, and that He was God and I was not. This began my journey of discovering the 6 Anchors of steadfast hope. Hebrews 6:19 says, “This hope is an anchor for the soul.” The Amplified Bible describes that anchor as “one that will not give out no matter the pressure upon it”. This is the hope that I longed for. Although I assumed my hope was in the right place, it gave way under the pressure of my circumstances. 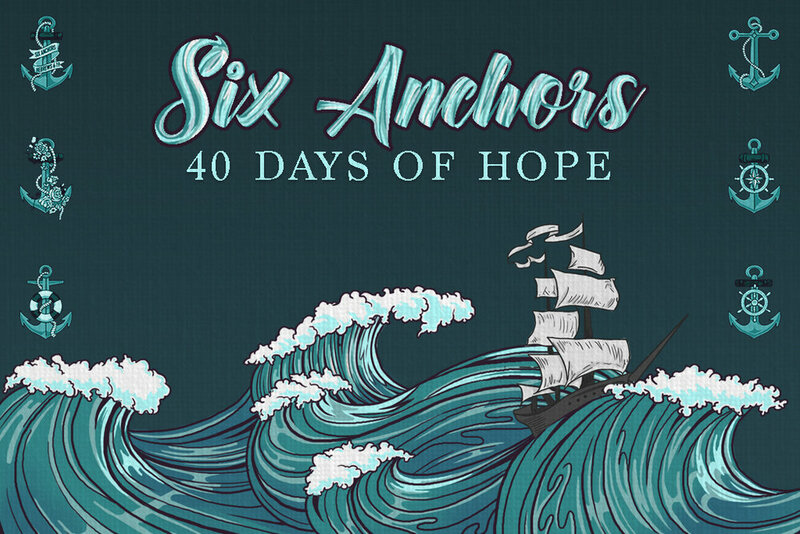 So, I scoured the scriptures for “this hope.” During my search, I came upon six places in which the Bible instructs us to place our hope; anchors that will remain strong no matter the storm I face. Today, we are taking a look at the first three of those anchors. In Acts 27, we read of Paul and a ship full of men becoming stranded in a mighty storm out at sea. The crew was becoming scared and disheartened but Paul arose and spoke hope to the men. He had received a word from God and was certain they would be saved. I can only imagine how much doubt Paul would have received in response, however, the men were drawn to his confidence. I too was drawn to the source of that confidence - the word from God. In Paul’s instance, he heard a direct message from God. However, for you and I, we do not need a directive from above because we have the Word of God set before us in the Bible. I find the Bible to be a great way to hear from God. It is a sure anchor and remains strong no matter the circumstances. The Psalmist of Psalm 119:81 found the same to be true when he said, “My soul faints with longing for your salvation, but I have my hope in your word.” When he had lost all hope, he found his anchor in the Word. In Luke 8, Jesus and his disciples were on a journey across a lake. Suddenly, their boat was struck by a major storm. The disciples, some of them experienced fishermen, were filled with fear. Their hope was placed in their experience on the waters, however, this anchor gave way. Jesus asked them, “Where is your faith?” In this time of chaos and panic, Jesus was teaching them to relocate their faith to Him. He qualifies as an anchor that will withstand whatever pressure that bears upon it. Paul speaks of Jesus in this way in Colossians 1. Paul had discovered that he could be content, even happy, in spite of his circumstances. This statement is astounding coming from a man who was currently in prison, suffering immense abuse. He told the Colossian church that his secret; “Christ in me, the hope of glory.” He discovered an anchor that held. Things of this life are fickle and don’t satisfy as we think they would, but Jesus does. He satisfies us and brings a deep joy and peace despite what is going on around us. We must see Jesus as who He is, see what He has accomplished on the cross, and see what he has done through His resurrection. If we sit and wait for God to move, then we tend to look to the wrong things for hope. We look to our being good enough, or praying enough, or for people to be ready enough, or for the right things to align instead of realizing that Jesus already did enough. He is our hope. He is our anchor. The hope of heaven is really anchored in the resurrection of Jesus. This one event has utmost importance in our faith. The fact that Jesus beat death allows us all to do the same and lean into the sure anchor of eternal life in Heaven. I implore everyone to personally prove to themselves, beyond a shadow of a doubt, that the resurrection of Jesus is true. When you do this, all things become possible and Heaven is a sure thing. Like I said in the book in Chapter 16, “The reality of heaven means we can remain steadfast. This world can throw anything at us, and we can remain unshaken because this world is just a small part of who we are; it’s not the finality of our existence. Again, this hope creates an unbreakable anchor that allows us to trust God more as well as love others on a deeper level.” We need to trust God more and we need to love others on a deeper level, because the church is the hope of the world and we are on our God-given mission to reach every available person, at every available time, by every available means, with the Gospel of Jesus Christ, by creating churches unchurched people love to attend.